Embracing the step up from an original PS4 to a PS4 Pro last year was one of my best decisions of recent times. It boosted my winter-hangover blues and made my gaming experience noticeably better. 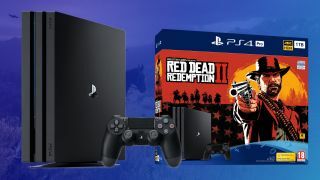 So, you can take my word that upgrading with one of the best PS4 Pro prices, deals, and bundles is a worthwhile move. If you're pondering on jumping into the world of PS4 for the first time, then the PS4 Pro also represents the best, and arguably only, place to start - particularly if you have a 4K TV. However, even if you don’t, a Pro will still enhance gaming and make everything on an HD TV look much better. My friend did exactly that last year - with a little gentle encouragement from me - and he went from zero PS4 straight to the glories of a PS4 Pro. So whatever your position, and pretty much whatever TV you have, getting a PS4 Pro is the best place to begin a Sony home-console journey. But, despite having been released and in the wild for more than two years now, the PS4 Pro holds it value and price exceptionally well. So finding an absolute bargain is a little tricky; there aren't many deals that show that list price slashed enormously but there are often some deals available that hover around that list price. As a result, you'll often find yourself tossing up between one or two deals that effectively have different games thrown in 'for free'. This is likely to always be your best bet, as, even if the game isn't one you're after you can turn it back into money quickly by trading it in immediately or selling it on - particularly if its a recent release. Why buy a PS4 Pro? If you own a 4K TV (or you're considering picking one up - here are our top picks for gaming) you can use a PS4 Pro to actually get things in 4K. Most modern PS4 games have a 4K option, and you'll be able to access things like Netflix Premium, which has 4K and HDR enabled TV shows and movies. You can find out which PS4 titles support the feature in our list of every PS4 game with confirmed PS4 Pro support. The standard price for the console - still a decent investment. Pros come in and out of stock in the UK, so if you REALLY want one, this is still a good price.